A Lobster clasp for chains with jump ring on the end. A lobster clasp with jump ring on the end. 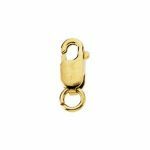 A large sized standard weight Lobster clasp for chains without jump ring on the end. Available in 14k yellow gold only. A round Lobster clasp for chains with a closed seamless connector ring on the end. A round Lobster clasp for chains without jump ring on the end. Available in 14k yellow. A round Lobster clasp for chains without jump ring on the end. A round lobster clasp for chains without jump ring on the end. Available in sterling silver.